After a full-course meal of blowouts in the first round of the 2015 NBA Playoffs, all four of the second round matchups currently sit at 1-1 as we enter a pivotal weekend of play which could very well determine who will advance to the NBA’s final four. While some series have been more exciting than others…. Thinking… Yeah you’re right; there hasn’t been enough bagels and Gatorade in the second round snap us, or Aron Baynes, out of the hangover daze from the epic Clippers-Spurs series. Even in this less than sober state, there have been plenty of moments to note from the conference quarterfinals. So it’s time to separate the fact from the fiction as we head down the windy playoff road. After a lethargic display in Game 1 without Conley, the Grizzlies sent the Warriors’ sea of yellow home with frowns on their Silicon Valley faces for only the third time this season. IMO it was just the second legitimate loss for the Dubs at home this season (first was back in November to the Spurs). Their loss to the Bulls at home in January was an either or game in which Golden State blew an 11 point fourth quarter lead and Derrick Rose hit a game-winner with just eight seconds left. 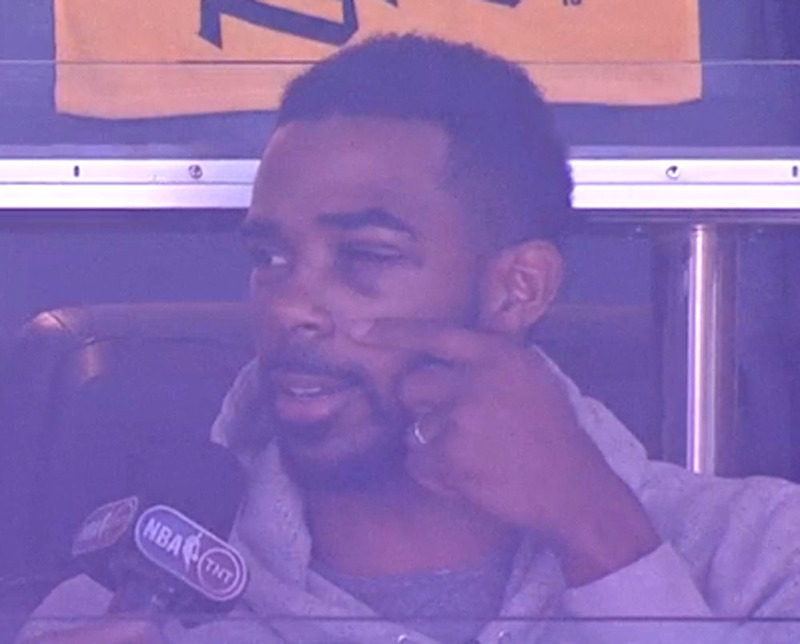 If you needed another reason to understand just how effing crazy professional athletes are, focus on the picture of Conley again. The guy had multiple plates inserted into his face and then a week later, played at a ridiculously high level in one of the toughest arenas in the NBA. 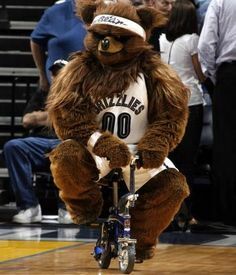 Conley’s barrage of off-handed push shots from just inside the free throw line, clutch three pointers and pace control was exactly what Griz wanted to see from his team. It may have taken what looked like a right hook from Mike Tyson in his prime for people to finally pay attention to Conley, but after his performance in Game 2 he should never be considered underrated again. 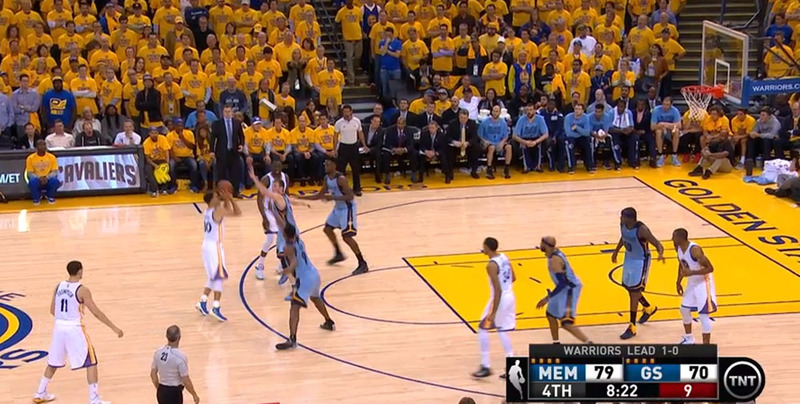 While Memphis’ Game 2 win in Oakland was extremely impressive, you couldn’t help but feel that a 90 second 10-0 swing run by Steph Curry was coming in the fourth quarter. After all, Steph’s MVP presentation was supposed to be the coronation of the new pace-and-space era in the NBA, but the run just never came. Klay Thompson couldn’t figure out how to unlock himself from Tony Allen’s straightjacket and while Draymond Green tortured Marc Gasol and Zach Randolph on defense for the majority of the game, he finished just 3-11 from the field. The loss popped the invincibility bubble the Warriors had inflated after their first round sweep of the Pelicans and their dominant victory in Game 1 against the Grizz. For the first time in his coaching career we’re going to find out how Steve Kerr handles the adjustments to give Curry a little more room to operate against a Grizzlies defense that was super aggressive while going over on 1-4 or 1-5 pick-and-rolls. He has even more space on this one. And this one, the NBA Jam pull-up three that goes in 99/100 times in the game if you were playing with Curry. The odds are ever in Curry’s favor to turn his Game 2 shooting woes around in the remaining games of the series, same goes for Klay Thompson, even though he’s way more of a streaky shooter than Curry. 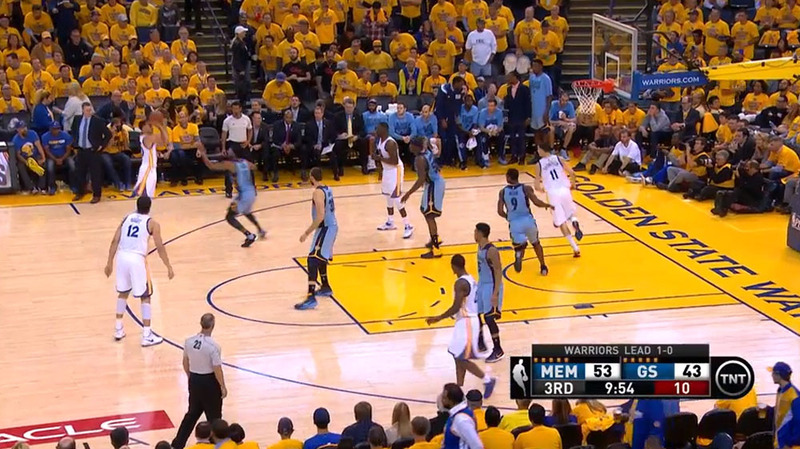 The only chance the Grizzlies have is if they’re able to maintain the defensive pressure they unleashed on the Warriors. It’s going to be extremely hard to keep up that level of energy on the defensive end for three-five more games against a team that can go big or small at will and have success with both styles of play. 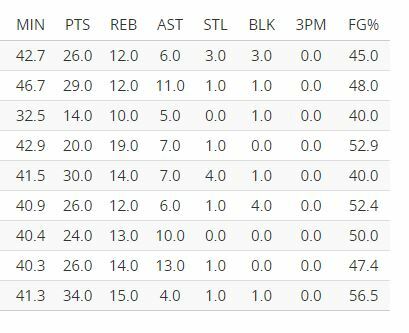 Also, Memphis’ starters have to continue to hover around their current net rating of 11.3. Conley-Allen-Lee-Randolph-Gasol are currently scoring 106.2 points per 100 possessions, which would have tied Atlanta for sixth in the regular season and they’re holding their opponents to 94.9 points per 100, which would have easily led the league. The headband is back everyone! All of the jokes about LeBron covering up his hairline can once again commence. However, the only thing Jimmy Butler was covering up were his eyes when he watched the replay of Vintage LeBron blowing by him and then dunking on him. There was plenty of chatter surrounding LeBron’s lackluster play in Game 1 against the Bulls. He was lethargic on defense and looked as though he was just trying to find his way on the court without Kevin Love and JR Smith. James crushed that chatter with a 14 point first quarter in Game 2, which began with a bevy of drives resulting in easy buckets for LeBron. He’s going to need quite a few more games where he dominates the floor like this if the Cavs are going to win the title in their depleted state. But hey, this is why he took the LeBatical back in January right? If Aron Baynes was that drunk after Game 7, imagine what he was like after this. Blake is clearly channeling his inner Westbrook. Flashback; a few years ago Charles Barkley said something during a playoff edition of Inside the NBA that feels very relevant now. He said, “When Blake Griffin understands how to play basketball, it’s going to be SCARY”. Turns out Barkley was right, because Blake is making a frightening leap. It was a fact before the news came down that John Wall has five broken bones in his wrist/hand after taking a nasty fall in Game 1 of the Wiz’s conference semifinals series against the Hawks. Now it’s nothing more than pure fiction. Ramon Sessions had a really nice showing in Game 2 (21 points, 8-14 from the floor in 40 minutes) and could be serviceable enough in the remainder of this series to eliminate what has been an underwhelming Atlanta Hawks team. But what would have been a VERY intriguing conference finals matchup between the Wizards and Cavs now takes a massive hit due to the health of Wall. Pierce chirping at LeBron is still going to be must-watch television if the two teams do indeed meet, but… man can we just not talk about this anymore? I’m getting sad. Speaking of sad, what the hell has happened in Atlanta? The once mighty Atlanta Hawks who won 19 straight games and became the first team in NBA history to not lose a single game during an entire month (January) now look like a middling five seed who struggled quite a bit to defeat the soulless Nets. Sure Mike Budenholzer’s Hawks were dealt a lucky hand of heath that has suddenly been ruined by the turn card as Al Horford (hand), Paul Millsap (shoulder) and Thabo Sefolosha (police beating leg) are all under 90-85 percent (no player is at 100% in the playoffs), but his team’s over-reliance on the three point shot has been their downfall. During the regular season, Atlanta was knocking down their threes at a 38% clip and shooting 26 per game. In the first eight games of the playoffs, they’re jacking up 32 threes per game at a 35% clip. The second half of Game 1 against Washington was just a gigantic mess as they unnecessarily took 19 shots from beyond the arc while the game slowly tilted in favor of the Wizards. Only four went in. FOUR. The Hawks have played by my count just six quarters of acceptable basketball for a one seed in the playoffs. You live and die by the three and right now the Hawks are being knocked out of the air with a barrage of bricks from everyone not named DeMarre Carroll. Atlanta does not have an offensive player that can scare opposing defenses with the ability to get his own shot. Their offense is predicated on precision movement and passing, with an extra emphasis on making that one extra pass in order to take the best shot possible (aka the Spursian pass). Right now the Hawks are not making that one extra pass, they’re settling for too many bad long-range jumpers. If Bud doesn’t turn this around quick, not even injury luck may be able to save the Hawks from going home before the conference finals. Still don’t believe me after watching the clip? Tony what do you think? Not a misprint, he’s actually hitting at a career high rate so far. After launching 271 threes in just 51 games this season (5.3 per game), he has already put up 51 in eight games (6.4), which ranks him only behind Kyle Korver (80) and Curry (67) for the most threes taken in the playoffs so far. Rose’s game had to evolve due to his slew of injuries, but you can just feel when he starts falling in love with his jump shot during a game. In the Bulls last three playoff games, Rose has taken 18 threes and zero free throws. The Bulls offense had so many bad iso-Rose possessions, especially down the stretch in Game 1 against a depleted Cavs team that it almost cost them a golden opportunity to steal home court advantage. We need to see more vintage Rose in this series, because Jimmy Butler can only carry the team so far by himself, especially with how old Pau Gasol looked in Game 2. He looked so bad that I’m convinced Tristan Thompson is still grabbing offensive rebounds in Gasol’s dreams. 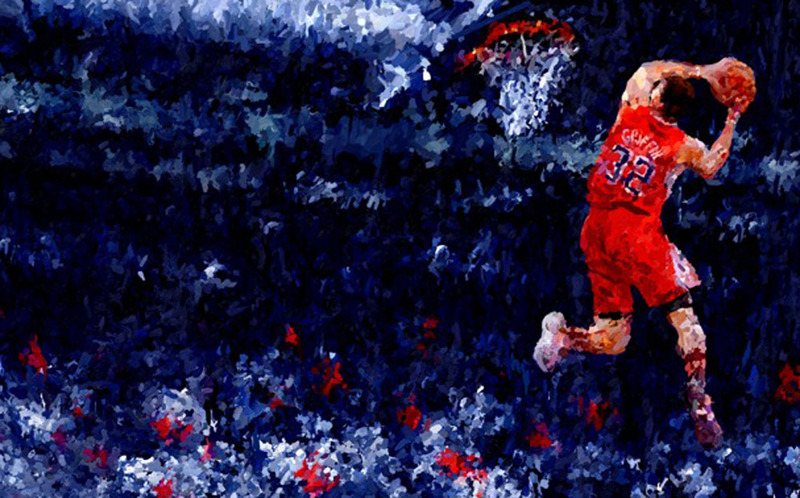 It’s tempting to continue watching just to see what Austin Rivers is going to do next. Will he finally get to the basket without slipping on that damn banana peel? Obviously there’s quite a bit on the line here and it’s a series that should have the feeling of must-watch television, but man it’s hard to get up for what you know is going to be a three hour free throw fest, especially when it’s the second game of a doubleheader. Game 2 clocked in at just over three hours due to a total of 96 free throws, which is tied for the sixth most all time since the NBA-ABA merger in ’76. If you’re watching to see if Kevin McHale is finally going to make an adjustment before the game feels like has already slipped away from him, then you’re already hooked and you don’t need any more encouragement to continue on. If not, just go to bed and pray that we’ll get a series that’s within the same realm of Clippers-Spurs. Is LeBron James becoming The Villain in his homecoming tale? Enter your email address to follow the 110 Percent Blog and receive notifications of new posts by Email.